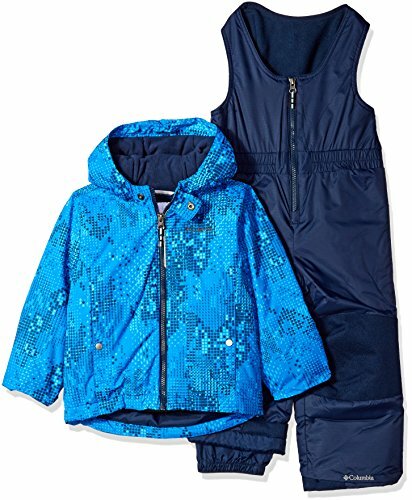 The Columbia Sportswear Toddler Frosty Slope Insulated Set includes a waterproof, insulated jacket and pants- the perfect outfit to keep your little one warm and dry whether sledding, skiing, or building a snowman this winter! Sporting Omni-Shield advanced repellency technology, it repels both stains and moisture for all-day dryness. The 100-gram Microtemp insulation and microfleece lining retains body heat to ensure lasting warmth. Internal leg gaiters lock out wind and moisture, while reinforced knees, seat and cuff guards resist wear and tear. Adjustable snap-back powder skirt, suspenders and cuff tabs provide a like-custom fit. Jacket: Bib Pants:.Micro fleece lined hood.Adjustable, snap back powder skirt with silicone grippers.Zippered hand pockets.Reflective detail.OUTGROWN grow system extends length.length: 16.5.Constructed of 100% nylon bottom, 100% polyester microfleece top.100% nylon taffeta lining.100% polyester microtemp 100g insulation.Waterproof fabric.Adjustable suspenders.Internal gaiter.Hammerhead reinforced seat and knees.Hammerhead reinforced cuff guard.Silicone grippers at leg opening.Gusset detail.Reflective detail.OUTGROWN grow system extends length.Avg. inseam: 13 in..